I’m taking a few fun vacations coming up in the month of May, which of course means that I start packing in April so I can be super prepared (Girl Scout preparedness!). It also helps me slowly get excited for the upcoming trip as I make all these preparations. One of the things I am most adamant about making sure to pack is my set of travel toiletries. For me, travel toiletries are a total essential. I don’t want to be parted from any of my favorite products just because they don’t fit within TSA standards, but I hate having to squeeze all my favorites into other tiny travel tubes. I find that it’s most fun to pick out your travel toiletry items if you know exactly where to find the best in product minis. My three favorite spots to get all my absolute travel essentials are Birchbox, Sephora & Target. I use all three for very different purposes, but I find that they are also equally important when it comes to prepping for an upcoming trip. If you have a Birchbox subscription already, you know that almost all of the products that come in your box are TSA friendly and are perfect for those weekend getaways. I especially love when a product favorite of mine, like the Coola Radical Recover After Sun Lotion, shows up in my box in a perfect size tube for travel. Since I can’t bring my 6 oz bottle on the plane with me, this little tube will be great for ensuring my face is saved from any sunburns and is also just great for giving my face that extra dose of moisture. For most of my shower and hair essentials, I love to hit up the travel section at Sephora. Those small sections of mini items that they have at the register are great for throwing in your makeup bag right before the big trip. They have all the necessities and usually in your favorite brands. Right now, I’ve been loving the Alterna Shampoo & Conditioner Replenishing duo for travel, knowing that my hair needs a little bit extra love after a full day of travel. And for all of my other toiletry essentials like toothbrushes, mini toothpastes, mouthwash, mini razors and makeup wipes, I always head to my local Target. Target has an awesome section for travel toiletries that could have everything you were looking for and a few items that you definitely hadn’t though of, bu absolutely need. One of my newest favorite travel finds at Target has to be the Gillette Venus Snap razor. It is so mini that it takes up like no space in my travel toiletry bag and it comes with its own case so I’m never worried about the blades cutting up anything in my bag. Target, I have to say you rule when it comes to travel size items! 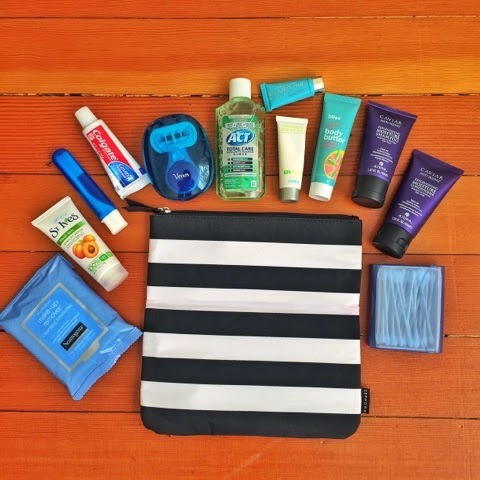 Have some travel toiletry favorites of your own? Share with me in the comments below! I love that mini razor!! I always seem to forget mine. We do a lot of weekend trips so this list is great! A mini razor is so smart! I love mini anything. I like going to Sephora as well for mini travel needs. It's always lots of dry shampoo and makeup wipes! I always use my Birchbox for travel or hospital and going to Target for a few faves!! Traveling has to be according to all the needs which exists in many ways and also usa bus tours east coast would always be something that has a lot of impact throughout that gives us many positive outcomes which are memorable.